By Amanda Tonoli | February 10, 2018 at 12:01a.m. A moment of silence appeared to be accepted in place of prayer at the Friday evening West Branch High School varsity basketball game. Those in attendance were asked to have a moment of silence for reflection, prayer or meditation following the National Anthem. The request received a round of applause by all. Gwen Lamp, 13, said she was happy for the return of some type of prayer – or time for prayer. “Prayer kind of represents this community,” she said. 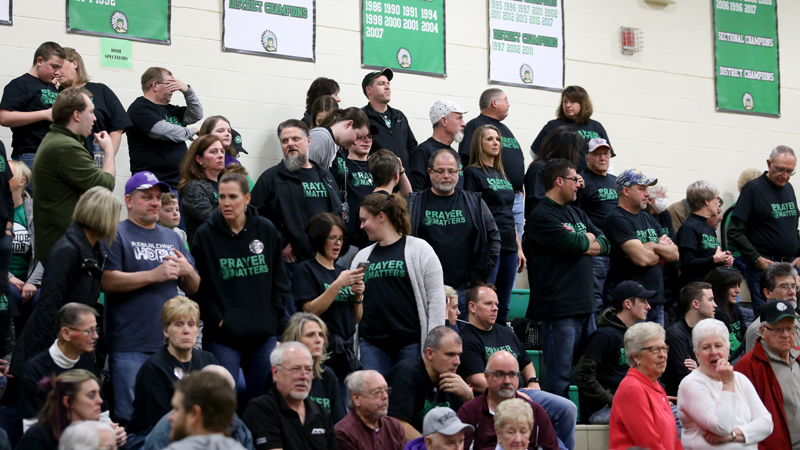 More than 100 people in attendance at the basketball game sported “Prayer Matters” shirts. The district halted prayer before athletic events after receiving a letter Jan. 18 from the Freedom From Religion Foundation stating the practice is unconstitutional. Addie Morris, 18, said although the moment of silence is a step in the right direction, it is still unconstitutional. Rebecca Markert, Freedom From Religion Foundation legal director, agreed with Morris and said the best course of action would be to just cease the action of prayer. Superintendent Tim Saxton said he had nothing to say about the moment of silence or the decision process that led to it. Paige Derry, 14, said she believes it’s her constitutional right to have prayer at school. In response, parents and community members have been taking sides. Some have made T-shirts that read “Prayer Matters” featuring the school’s Indians mascot. Others designed shirts seeking an all-inclusive environment featuring “Coexist” spelled by using symbols of many religions. It also sports the Warriors’ logo. February 9, 2018 9:26 p.m.
February 16, 2018 12:08 a.m.
February 3, 2018 12:06 a.m.
February 7, 2018 10:10 a.m.
February 2, 2018 10:55 p.m.